Getting to know the Disc: Gripping, spinning and self-toss games. For most players, playing with a frisbee disc may be a new experience. If the instructor is familiar with a disc, s/he may show the various grips and throw some throws to demonstrate the flight paths of the disc. Or, perhaps a player will demonstrate. Distribute a disc to each player and permit them to mimic the instructor’s actions: changing hands with a short toss, switching grips, spinning it, pivots, etc. Warmups: A handful of exercises to get the body ready to play. The proper warm ups are vital to any athletic activity, and Ultimate is no exception. Ultimate requires sprinting, change of direction, twisting, jumping, lateral movement and more. The seven basic dynamic warmups are a minimum set of exercises to complete before every Ultimate activity. They simulate some of the essential body mechanics used during play. These seven warm ups are designed to be suitable for Ultimate players of all ages. Torso Rotations, Squats, Jumping Jacks, Skater Leans, Leg Swings, Arm Circles, Accelerating Runs. The location of this video is the birthplace of Ultimate Frisbee in Maplewood, NJ. 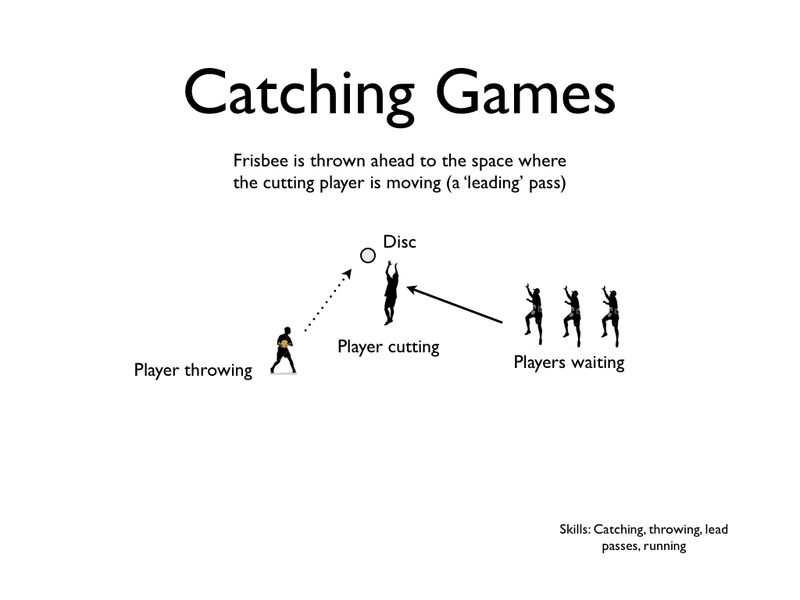 Catching Games: To catch a flying disc is to stop it from spinning. Form small lines of 4-6 players where they wait for the instructor or a designated thrower to throw a pass to each of them one at a time. First, try catching a pass thrown directly at a stationary player, and then have the player run it back to the instructor. After that, try having the players cut away from their peers at different angles, such as perpendicular to the line, and catch a leading pass while on the run. Don’t run with the disc (Traveling): Introduce Pivoting. Explain the rule: if the player who possesses the disc lifts or drags their pivot foot from its point of contact before they release the disc, it is a Travel. Later – in games: Unless there was a turn over, return the disc to the player who traveled and allow the defense to get ready before play resumes. Pairs Throwing: Review technique and throw back and forth with a partner. Show proper grip, emphasize flat release and spin, stay balanced and step into your throws with the same foot as your throwing hand (left foot with left hand or right foot with right hand). Most players may be initially attracted to Ultimate because they like throwing the disc. But many may also find frustration in developing consistent throws. Don’t get discouraged – repetition is needed. Instructors must repeatedly encourage their players to exercise patience, to endure mistakes and learn from them. Trial and error is useful. When a throw is good, mimic the same form again. 1) Don't run with the disc; 2) Scoring a point and 3) No contact. "The integrity of Ultimate depends on each player's responsibility to uphold the Spirit of the Game, and this responsibility should remain paramount." Allow players to begin self-officiating as soon as they seem to understand the rule concepts.